To the Editor: The South African Guideline for Office Spirometry was recently published. Its aim was to provide an updated guideline for office spirometry in South Africa (SA), thereby improving the quality, standardisation and usefulness of spirometry. The need for local prediction equations based on large, all-inclusive studies of the SA population was highlighted in this guideline. It was suggested that the European Community for Steel and Coal (ECSC) prediction equations, derived from the study of Europeans, should be used as a norm, and that the use of a correction factor for adjusting predicted values that was sometimes applied in the past be discouraged. Function Initiative (GLFI), 2012. This large cohort (from 33 countries) included 3 545 black and 8 255 South-East Asian individuals. The authors suggested updated algorithms for the lower limit of normal (LLN) and the z-scores, and highlighted the racial differences as well as the great need for studies from the African continent. 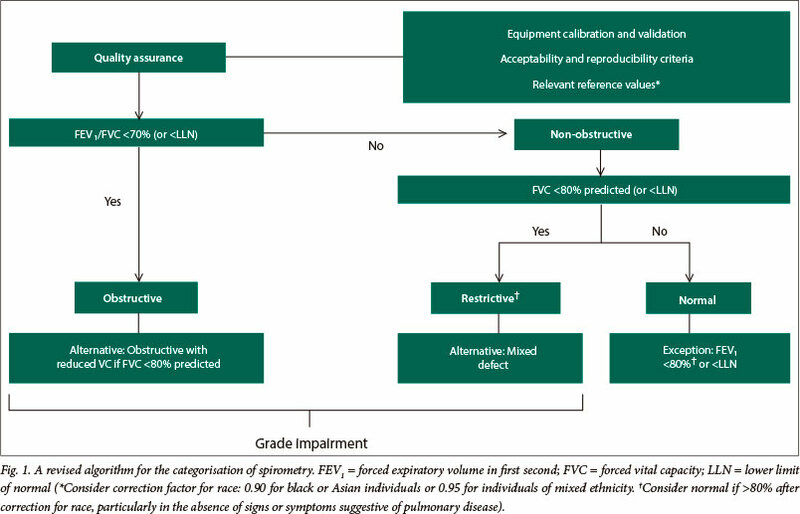 The ERS GLFI aims to improve spirometric lung function reference values, and the most recent regression equations were published in May 2013 on their website (http://www.lungfunction.org). Quanjer et at. 's'21 findings confirmed previous observations that the FEV1/FVC ratio is similar for blacks and people of Asian descent, but that both the FEV1 and FVC are around 90% of the predicted value for Europeans. To avoid the over-diagnosis of particularly restrictive impairment, and to avoid over-investigation of healthy individuals, it is therefore suggested that the correction factor of 0.9 for these particular ethnicities be used (e.g. in a 45-year-old Asian male with a predicted FEV1 of 3 l (according to ECSC predictions) the value would be corrected to 2.7 l (3.0 x 0.9)). The GLFI also recommended that for individuals of mixed ethnic origins, a composite equation taken as the average of the equations may be used to facilitate interpretation until a more appropriate solution is developed. A correction factor of 0.95 is therefore suggested for individuals of mixed ethnicity. In summary, the SATS would propose that a correction factor of 0.9 (for black and Asian individuals) and 0.95 (for individuals of mixed ethnicity) is employed when European-based equations (e.g. ECSC predictions) are used, and that the algorithm in the original SA guideline is altered accordingly (Fig. 1).